The last thing you would want to add to your family at the time of their emotional loss and grieving is financial pressure. One of the keys to creating a sound end of life plan is to access and complete our Family Record Guide (which can be downloaded, saved, or printed for FREE). Another important aspect that is largely overlooked is having a “Love Drawer”, which is a place that is readily accessible that someone you love and trust can turn to. A “Love Drawer” is a place were you keep all of your important financial, insurance, estate, and end of life planning matters. It also contains detailed instructions for all aspects of your last wishes, financial affairs, end of life plans and preferences, and prepay funeral costs by using funeral or burial insurance. This “Love Drawer” also helps you leave behind personalized messages, stories, lessons, or even life’s most precious values. All of this can help ease your families emotional and financial burden at during what is arguably one of the most difficult experiences of their life. 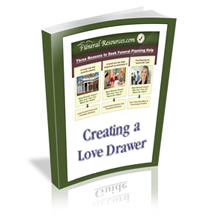 Why Should You Create a Love Drawer? Although it requires some time and effort to create this love drawer (maybe a few days or so), the old adage that “nothing good comes easy” certainly applies here. So regardless of how much effort and time it may take, we are fully confident that, once completed, you will look back on this as time well-spent for both you and your family. For you, it can help you experience great ”peace of mind” knowing that your loved ones can more easily handle most of your financial and estate planning affairs without any unnecessary financial pressure, confusion, or disagreement. For your loved ones, they now have that special gift to be able to remember you the way you would have wanted…kind, generous, giving, and thoughtful. More importantly, by eliminating many of the pressures and grief and loss surrounding such a difficult time, your loved ones can now focus on what’s most important, which is the celebration of you life’s wonderful stories and memories. Simply enter your confidential information into the form below and your Ebook will be delivered to your email account within minutes. Also, you can help someone you care about by forwarding this FREE Ebook to them as well.